I wrote this story for the Dallas Morning News. It was published on Nov. 27, 2001. WARNING: Some photos are graphic. Opposition troops’ triumphant march into the Taliban’s last northern stronghold ended Monday in confusion, savagery, and celebration. 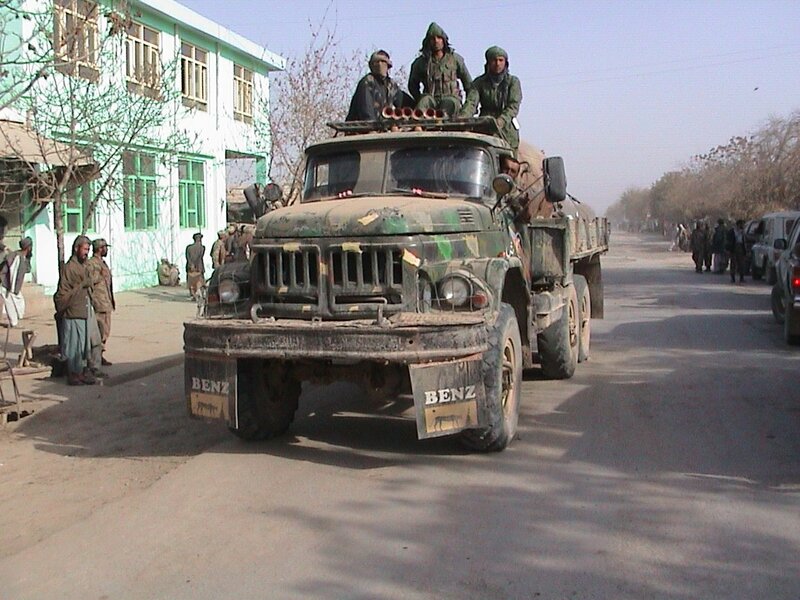 Gunbattles broke out early, a day after the Northern Alliance claimed to have taken Kunduz. Panicked opposition soldiers ran wildly through the streets, ignoring the groans of wounded fighters bleeding on the ground. By late afternoon, the chaos had subsided. Opposition troops reportedly captured and disarmed thousands of Taliban soldiers, gaining control of the city of 100,000 after a two-week siege. The victory left the Taliban regime holding just one major city, its southern base of Kandahar. It was peace punctuated by gunfire as the Taliban put up a stubborn rear-guard attack. The day began with alliance soldiers rolling west from the city of Taloqan and into Kunduz in a convoy of battered Russian-made jeeps and trucks. Word had gotten around that Taliban soldiers were on the run. Alliance officials said hundreds, perhaps thousands, retreated to a nearby village. Near mud-brick homes and shuttered shops in Kunduz, though, some were still fighting back. Others said 30 to 40 alliance soldiers and nearly 100 Taliban were killed or wounded in the fighting. Those numbers couldn’t be verified. Far fewer dead or wounded were evident on the streets in the center of town and at the hospital. One injured alliance fighter sat in the back seat of a broken-down Russian jeep. Radiator fluid dripped onto the ground; blood streamed down his neck. “This man needs a ride to the hospital!” a friend yelled to a passing alliance jeep. “I’m not going that way,” shouted the driver, putting his foot on the accelerator. Opposition soldiers were seen shooting wounded Taliban troops where they lay, and beating others. 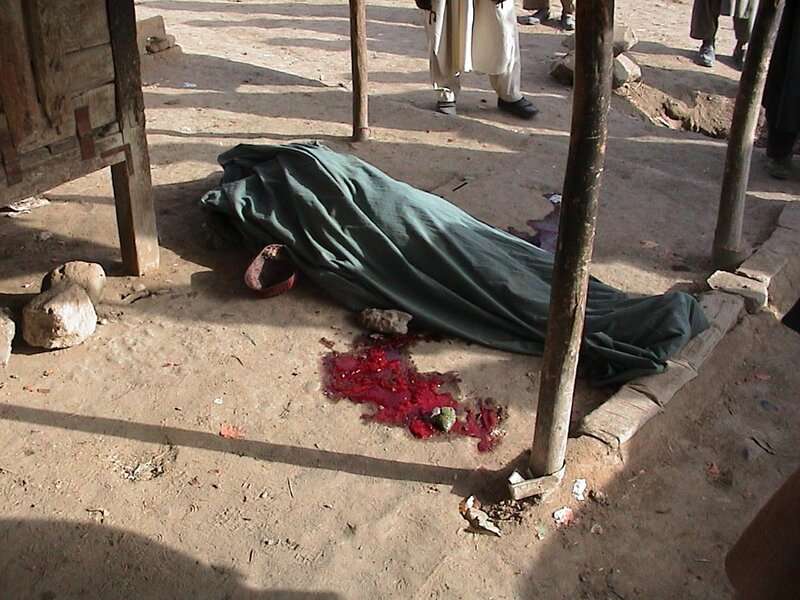 In empty market stalls were the bodies of three Taliban fighters. Cords bound each soldier’s big toes together to hinder any attempt at escape while he was alive, The Associated Press reported. Witnesses said the three were wounded when they were captured Sunday, then executed Monday by the opposition. Several hundred Taliban went into a mosque and were surrounded. Alliance commanders said the fighters negotiated their way out; it was unclear whether they escaped or were captured. Five or six Taliban hiding at a cotton-processing plant near the mosque fired at opposition soldiers. Villagers and the soldiers scattered in every direction. Later, alliance troops said, they returned to capture the Taliban fighters. 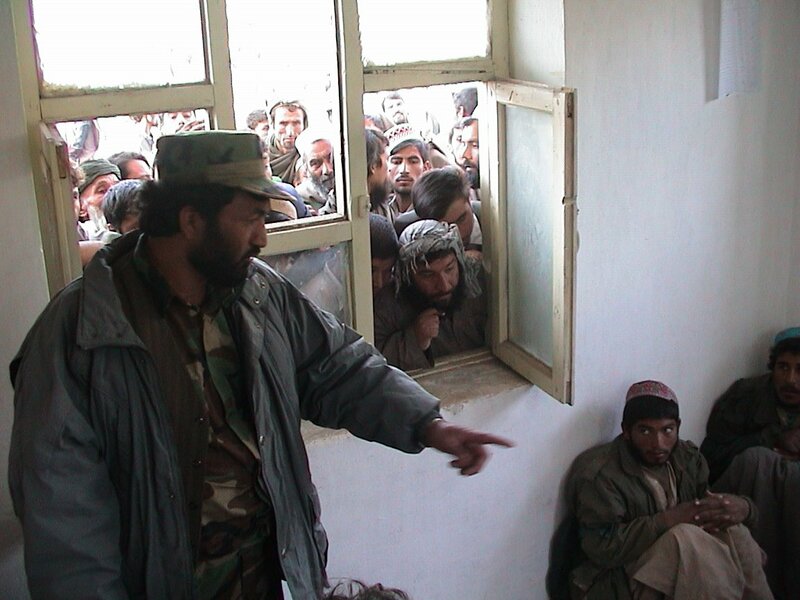 Opposition soldiers believed that more Taliban fighters were at large. Soldiers searched from house to house, but some townspeople complained that they seemed more concerned about looting former Taliban-controlled buildings than ensuring public safety. Minutes earlier, Haroon had grabbed a man off the street, tied him up and loaded him into a truck. “I know this man. He’s part of the Taliban militia. He used to steal money from people in Taloqan,” the commander said. “I’m going to take him to Taloqan, and he’s going to have to face the people he robbed. His prisoner, Salim, said he left the Taliban forces months ago and was unarmed. “I have done nothing wrong,” he said. 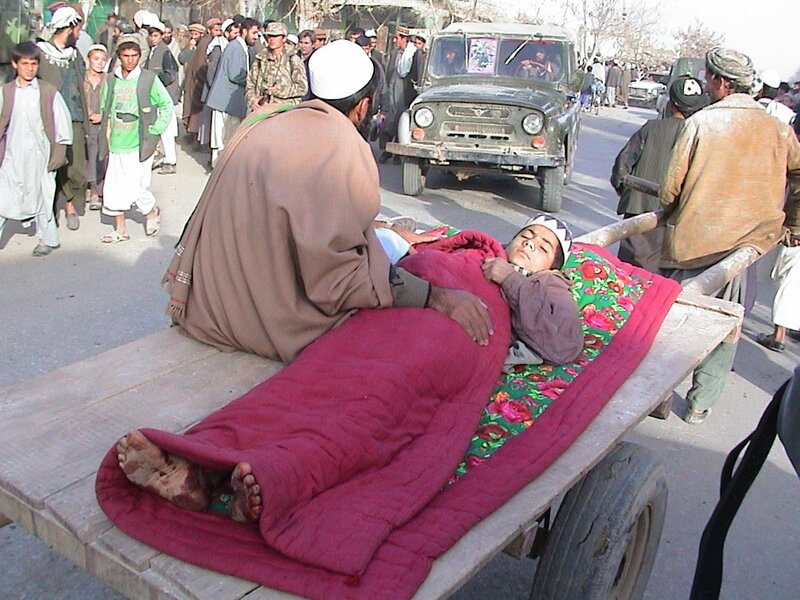 Down the street, soldiers laughed and poked at the body of a Taliban fighter. One pressed the barrel of an assault rifle against the man’s face. “These people are like savage dogs,” a disgusted shopkeeper said as he rushed past. On the main street of Kunduz at midafternoon, an Afghan Taliban seemingly trying to win over uniformed soldiers who had caught him was suddenly on the ground. The soldiers smashed their rifle butts into him, then stomped on his face, The Associated Press reported. Afterward, they threw his motionless body into the back of a truck. Like the Taliban, the Northern Alliance has a reputation for brutality. While occupying Kandahar years ago, for instance, its forces were accused of robbing merchants and kidnapping and sexually assaulting girls. On Monday, they were firing assault rifles in the air above cars that refused to take them into Kunduz. “They’re in a hurry, but not to fight. They want to see what they can steal,” a taxi driver said. 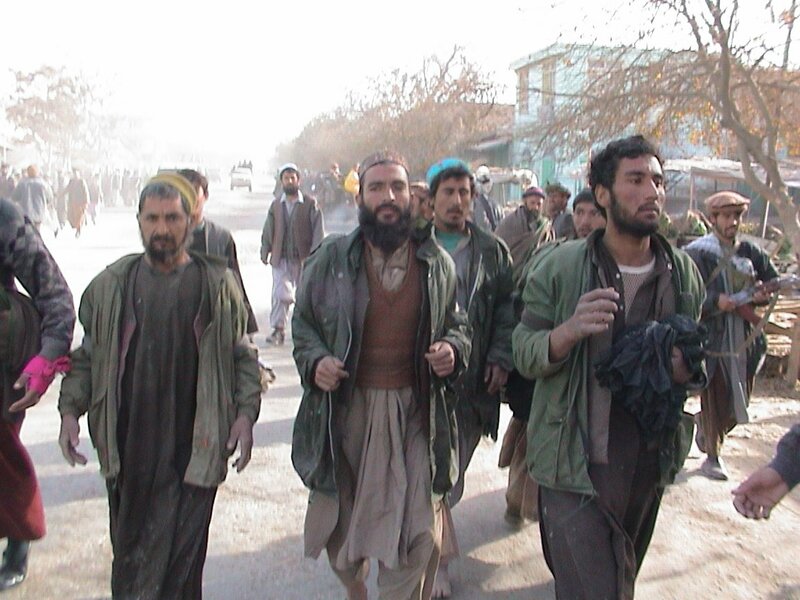 During the Taliban’s rise to power, leaders promised to restore peace and enforce Islamic law. 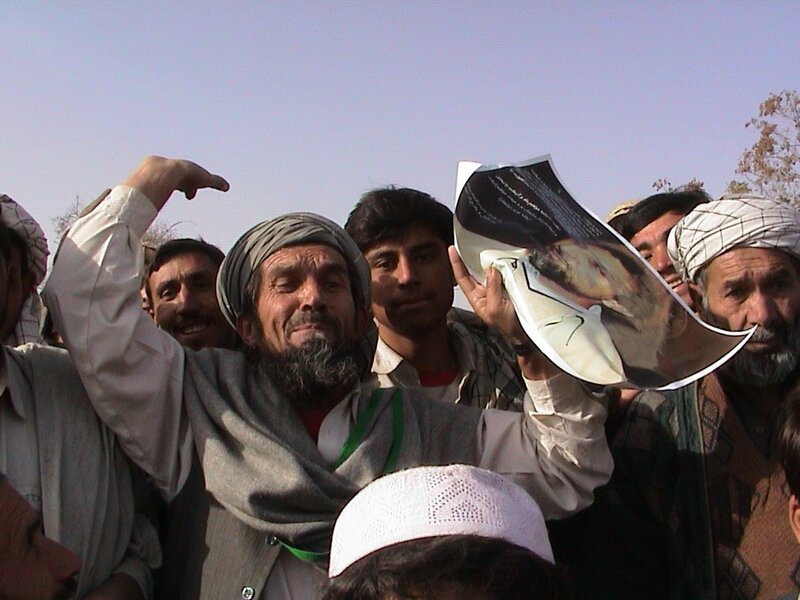 They had some support in the beginning, Kunduz residents say. But then they went too far. They imposed draconian restrictions on women, demanded that their religious practices be followed and banned music, lipstick, and fashion magazines, among other things. Mr. Reza is not sure that the alliance will be any better. “If they bring peace to Kunduz, we’ll be happy with them. If not, we’ll never be happy,” he said. Still, for a few fleeting moments on Monday, many townspeople were relieved to see the Taliban leave. Hundreds cheered. A bearded man named Haji Jan Mohammad, 60, grabbed a poster of Ahmed Shah Massood, an alliance military chief who was assassinated in September. Mullah Mohammed Omar, who lost his right eye in 1989, is the Taliban’s reclusive leader, and Pakistan is seen by many in Afghanistan as the Taliban’s chief foreign sponsor. Television was also banned under Taliban rule, said Nikmohamad, 20. “I used to watch it at home with the volume turned down real low,” he said. “I’m glad I never got caught. “As punishment for watching TV, the Taliban would blacken your face with oil, hang a heavy TV set around your neck and make you walk around the city for three or four hours.